The Siege of Port Royal (5 – 13 October 1710), [n 1] also known as the Conquest of Acadia,  was a military siege conducted by British regular and provincial forces under the command of Francis Nicholson against a French Acadian garrison and the Wabanaki Confederacy  under the command of Daniel d'Auger de Subercase, at the Acadian capital, Port Royal. The successful British siege marked the beginning of permanent British control over the peninsular portion of Acadia, which they renamed Nova Scotia, and it was the first time the British took and held a French colonial possession. [n 2] After the French surrender, the British occupied the fort in the capital with all the pomp and ceremony of having captured one of the great fortresses of Europe,  and renamed it Annapolis Royal. Annotated detail from a 1713 map showing eastern New England and southern Nova Scotia/Acadia. Port Royal is at A, Boston at B, and Casco Bay at C.
Samuel Vetch became the first governor of Nova Scotia. In 1746, the grand expedition was organized in France under the command of the Duc d'Anville. The expedition was composed of 20 warships, 21 frigates, and 32 transport ships, containing 800 cannons, 3,000 soldiers, and 10,000 marines. 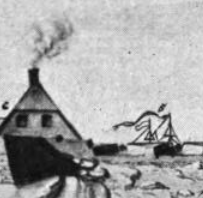 The expedition was to retake Louisbourg and then Annapolis Royal. 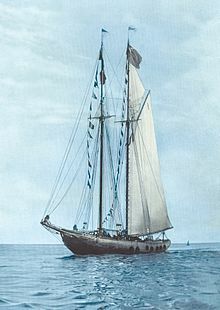 However, after a three months crossing, and the dispersal of the fleet between Sable Island and the mainland, the expedition turned out to be a disaster for the French, and they would not try to recapture Port Royal again. Hobby's Regiment (Massachusetts Bay), Colonel Sir Charles Hobby. Tailer's Regiment (Massachusetts Bay), Colonel William Tailer. Whiting's Regiment (Connecticut), Colonel William Whiting. 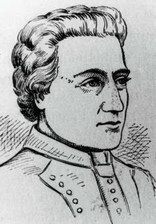 Walton's Regiment (New Hampshire), Colonel Shadrach Walton. Company of Gunner and Matrosses, Colonel Samuel Vetch, Captain. Company of Indian Scouts ( Iroquois Indians), Major of Scouts John Livingston, Captain. ^ According to Grenier (2008), p. 12, prior to 1710, English forces had only raided, sacked, and temporarily occupied French colonial possessions. Other territories the English conquered came at the expense of other nations or aboriginals. ^ For "Mi'kmaq" versus "Micmac" or other potential transliterations, see the article Mi'kmaq people. ^ Made up of detachments from Holt's, Will's, Fox's, Shannon's, and Churchill's regiments of marines. ^ a b c Griffiths (2005), p. 234. ^ Reid, John G.; Basque, Maurice; Mancke, Elizabeth; et al. (2004). The "Conquest" of Acadia, 1710: Imperial, Colonial, and Aboriginal Constructions. University of Toronto Press. ISBN 978-0-8020-8538-2. ^ Prins, Harald E.L. (1996). The Mi'kmaq: Resistance, Accommodation, and Cultural Survival. Fort Worth: Harcourt Brace. ISBN 0-03-053427-5. ^ Grenier (2008), p. 15. ^ McKay, Ian and Bates, Robin. In the Province of History: The Making of the Public Past in Twentieth-Century Nova Scotia. McGill-Queen's University Press. 2010. p. 78. ^ Baudry, René (1979) . "Monbeton de Brouillan, Jacques-François de". In Hayne, David. Dictionary of Canadian Biography. II (1701–1740) (online ed.). University of Toronto Press. ^ Faragher (2005), p. 113. ^ a b Faragher (2005), p. 114. ^ Griffiths (2005), p. 224. ^ a b c Griffiths (2005), p. 233. ^ a b c Griffiths (2005), p. 235. ^ Donald Chard. Canso, 1710–1721: Focal Point of New England-Cape Breton Rivalry. Nva Scotia Historical Society. 1975. p. 50. ^ Griffiths (2005), p. 253. ^ Campbell & Kent 1785, vol. 5, p. 116. ^ Drake 1897, p. 259. ^ Dalton 1904, pp. 283-290. ^ Bouton 1864, p. 453. ^ Chartrand 1993, p. 162. ^ Baudry 1969, p. 38. Baudry, René (1969). "Aguer de Subercase." Dictionary of Canadian Biography. Toronto: 35-39. Bouton, Nathaniel (1869). Documents and papers relating to the Province of New Hampshire. Vol. III. Manchester. Campbell J. & Kent, John (1785). Biographia nautical. Dublin. Chartrand, Rene (1993). Canadian Military Heritage. Vol. 1. Art Global, Inc.
Dalton, Charles (1904). English Army Lists and Commissions Registers, 1661-1714. Vol. VI. 1707-1714. London: Eyre and Spotswoode. Dunn, Brenda (2004). A History of Port-Royal/Annapolis Royal 1605–1800. Halifax, NS: Nimbus. ISBN 978-1-55109-484-7. OCLC 54775638. Ells, R. W (1907). The Geology and Mineral Resources of New Brunswick. Publications of the Geological Survey of Canada. Ottawa: Geological Survey of Canada. OCLC 623250098. Faragher, John Mack (2005). A Great and Noble Scheme: The Tragic Story of the Expulsion of the French Acadians from Their American Homeland. W.W Norton & Company. ISBN 978-0-393-05135-3. Fryer, Mary Beacock (1986). Battlefields of Canada. Toronto: Dundurn Press. ISBN 978-1-55002-007-6. OCLC 15554679. Grenier, John (2008). 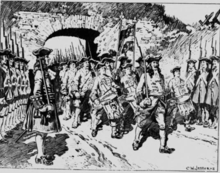 The Far Reaches of Empire: War in Nova Scotia, 1710-1760. University of Oklahoma Press. ISBN 978-0-8061-3876-3. Society of Colonial Wars (1897). Publications of the Society of Colonial Wars, Number 3. Boston: self-published. OCLC 5250963. Contains muster rolls and other documents concerning Massachusetts participation, as well as an official British account of the expedition.